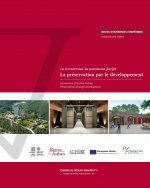 Following the three years of the At Fort project this bilingual publication presents a selection of exemplary projects and procedures used for Vauban’s majors sites and their Europeans partners to redevelop fortified spaces. With its seven thematic chapters this book deals with the main topics that were central to the At Fort exchanges and set out the main valuable lessons of the project. Accessibility, town and country planning, governance, restoration but also vegetation, communication or renewable energy sources, this pooling of experiences is aimed to every professional exercising an activity linked to the management of fortified heritage. It was written to be a real source of inspiration and to enrich our way of thinking in order to reconvert fortified sites. From the New Dutch Waterline (the Netherlands) initiative and with ten other fortified sites and networks in Europe , the Vauban Network participated from 2012 to 2014 in the INTERREG IV C project “At Fort: powering local sustainable development”. Sharing the conviction that the preservation of this heritage can only be achieved through development, the At Fort project partners explored solutions, approaches and methods which incorporate past architectural, spatial and environmental contexts and to create powerful blueprints for their regeneration. For three years the partners worked together and shared best practices and experiences on the different issues linked to the redevelopment of fortified sites. On 22 May 2012 the AT FORT partnership Agreement was signed by eight representatives of the eleven “AT FORT partners in Utrecht, the Netherlands. In June 2013 the Vauban Network invited all the partners in Besançon for the Midterm Event and an atelier dedicated to landscaping, maintenance and spatial planning. The At Fort Final Event will take place in Suomenlinna (Helsinki), Finland the 27th and 28th of October 2014.